Vogue Gioiello presents an exuberant inspiration for this summer’s perfect pedicure. Red gold ring with black and white diamonds. Crivelli. Opposite. Rings with brown diamonds. de Grisogono. Left. Rose gold ring with smoky quartz and brown diamonds, yellow gold ring with citrine quartz and orange sapphires. Hausmann & Co. Scale courtesy stube. Right. Rose gold ring with diamonds. Moraglione 1922. Yellow gold rings with diamonds. Octium. 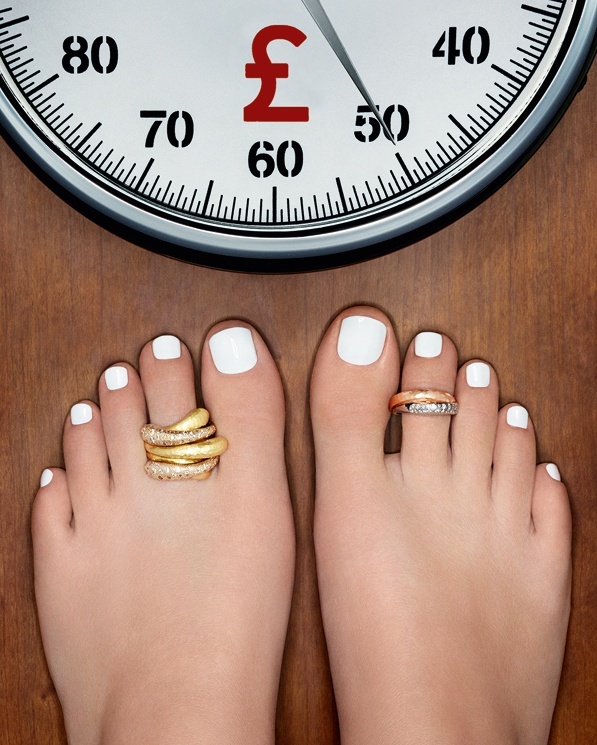 Nice with the rings – but even nicer would be to have cartoon feet like those perfect pair! A bit too retouched perhaps..? But then who would enjoy an ad like this with ugly feet haha.